Lean Canvas is one of the most widely used tools today to test ideas, breakthroughs and solutions for business case funding, product market fit and go-to-market. It invites conversations from multiple perspectives to focus, vet and advance an early decision on your opportunity. It articulates your product-market fit assumptions and saves time before you invest more effort. It’s also practical, versatile and proven. Thousands of companies and entrepreneurs have used Lean Canvas rather than unwieldy business plans that add time, overhead and unnecessary length. What’s exciting about Lean Canvas is that it addresses many business disciplines, criteria and factors in one place. It visualizes how all key dimensions affect your new idea or solution on one concise chart. It also enables you to validate your key assumptions. You can pitch Lean Canvas to investors to make your business case or convey new product opportunities to internal stakeholders and customers. Lean Canvas supports not only collaborative brainstorming but also creates a shared language, framework and understanding of the go-to-market opportunities, issues and risks. Lean Canvas is iterative and evolves continually as your business activities, customer insights or assumptions change. Lean Canvas can be an effective precursor to a more comprehensive effort, such as Business Model Generation (e.g., Osterwalder, Yves Pigneur, Timi Clark, et al.). Lean Canvas uses nine building blocks mapped in one poster. The left side represents the solution and the right side represents the market. Each block contains activities or assumptions about your solution that you will need to validate. All the elements should relate to other elements in different blocks. We adapted Lean Canvas to healthcare by adding categories for regulatory, reimbursement, value, and analytics. You can also create different versions of the Healthcare Lean Canvas for each customer segment (health plans, self-insured employers, brokers, health systems, medical device manufacturers, life sciences) as well as different personas (physician, nurse, patient, caregiver). There are no set rules on how to use the Healthcare Lean Canvas. We compiled best practices from our own client experiences, working with over 50 founders, and evidence from practitioners in this area, such as MIT, Stanford, and many others to shortlist a few effective tips. For further investigation, you can find many helpful sites in the Resource Table. Here are some simple tips to sketch your first canvas. First, download the Healthcare Lean Canvas or sketch it on a white wall with post-it notes and markers. Verse yourself in Lean Canvas elements before you huddle with your team and trusted advisors. Do Study Your Competitive Landscape, Comparables, Customer Journeys, Care Pathways, Evidence and Clinical Workflows before you start: Digital healthcare, life sciences, devices, IoT, AI, diagnostics are converging. While convergence creates opportunities, significant overfunding by angels and VCs has resulted in crowded market segments and overlapping claims (reduce readmissions, etc.). Understand your competitive landscape and where you play in adjacent markets (mind map example below). Know the substitutes to your solution, your customer’s “jobs to be done” and where you add value to overcome barriers to entry (i.e., top EMR companies and customers make data access challenging for new clinical workflow solutions). Finally, too many healthcare entities believe a simple pilot will suffice in lieu of publishable clinical study or IRB. Think Health Consumers first, Patients second: Value drives the healthcare sector, quantified by quality healthcare outcomes. Creating value for health consumers/patients is a unifying factor for industry stakeholders. Healthcare Lean Canvas places the highest priority on the Payment/Reimbursement Model (follow the money), Healthcare Value Model and Problem Segments. Design your healthcare value propositions well. You have about 5 to 30 seconds to hold your viewer’s attention. Well-crafted value propositions keep your audience and help you focus, differentiate your messages and sell more effectively. The reasons why customers buy your solution is for perceived value and realized outcomes. 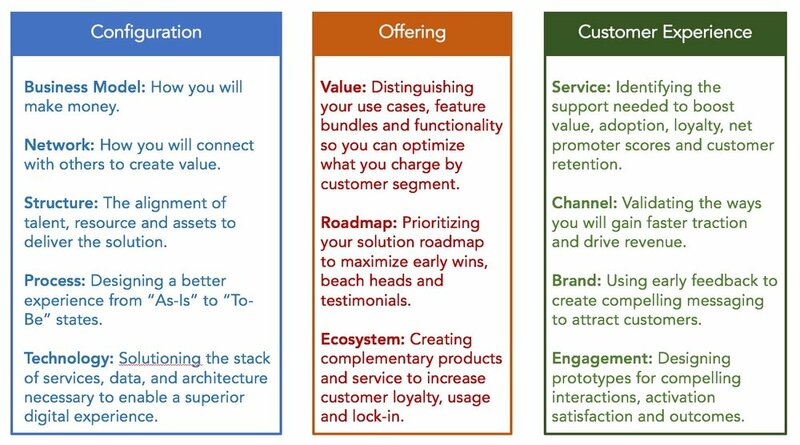 A value proposition is an experience, bundle of activities (services) or products that deliver benefits (functional, emotional, social) which result in desired gains or reduced pain. In healthcare, value has many tangible and intangible benefits -- improved, life-changing outcomes, better patient experience, lower cost, improved clinical workflow, higher reimbursement, faster return to work, sustained wellness and so on. Healthcare value delivered by your solution can accrue to many beneficiaries, but not all will pay. You will need to follow the money, uncover the reimbursement model and align your solution’s value. Your healthcare value proposition is likely tied to your target market segment. You will need to describe how you intend to deliver value. This can be the benefits derived from your solution’s features. Be specific and compelling about these benefits. Also important are the emotional benefits from your customer’s experience with your solution (customer journey map). Map and prioritize the key benefits of your solution offerings to your customer’s jobs-to-be-done, pain points, unmet needs, emotional needs and social needs. As your value proposition begins to take shape, it is important to compare it against your competitors’ value proposition, or at least your best estimate of what those are. This is different from—and more challenging than—merely comparing tangible product and service offerings. In comparing value propositions, it is important to look at potential alternative solutions, not just immediate substitutes. Evaluate your value proposition relative to the status quo (what we have is good enough) and build alternatives internally. For example, many large health systems and health plans today have captive incubators that evaluate third-party digital health solutions but take it upon themselves to build internally. Unique features: Online coaching and tracking, gamification of treatment, social contracts—sharing of progress among stakeholders to ensure patient compliance with the treatment plan, curated, customized education tailored to the patient’s journey map, etc. A final component of a value proposition is your promises and claims: tangible proof points or customer reasons to believe that your solution works. This requires creating and continually reinforcing “evidence” to ensure customers will derive the benefit and value you’re promising. Examples of proof include social proof, patient testimonials (people like hearing from others, evidence-based clinical studies, customer case studies, trusted key opinion leaders (KOL), ROI models and assurances (warranties, shared cost savings, money back, trial periods). 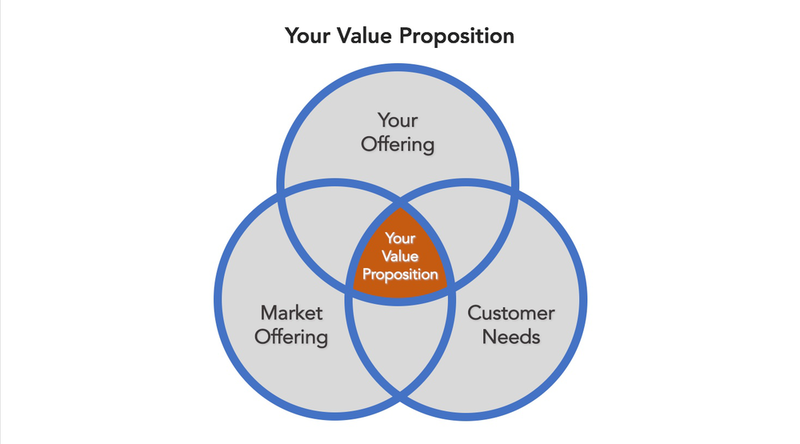 See Value Proposition Templates examples and questions in the Key Questions section. Value in healthcare is complex. It can be defined as quality, patient experience and outcomes that are achieved for a given cost (direct and indirect). The value equation also relates to IHI’s Triple Aim for healthcare (improve the patient experience of care, improve the health of populations and reduce the per capita cost of healthcare). In the U.S. and internationally, there are many KPIs/measures for outcomes ranging from changes in blood pressure in patients with hypertension to patient-reported outcome measures (PROMs). If your solution demonstrates direct improvement on these measures, particularly measures tied to financial incentives (MACRA – MIPS, APM) or presents credible, real-world evidence for clinical trials programs, then note how your offerings impact the delivery of care in terms of quality and cost in the Healthcare Value box for Healthcare Lean Canvas. Another helpful tool that can inform your Healthcare Value box is the Healthcare Value Tree. The Healthcare Value Tree builds on the methodology for a business value driver tree. 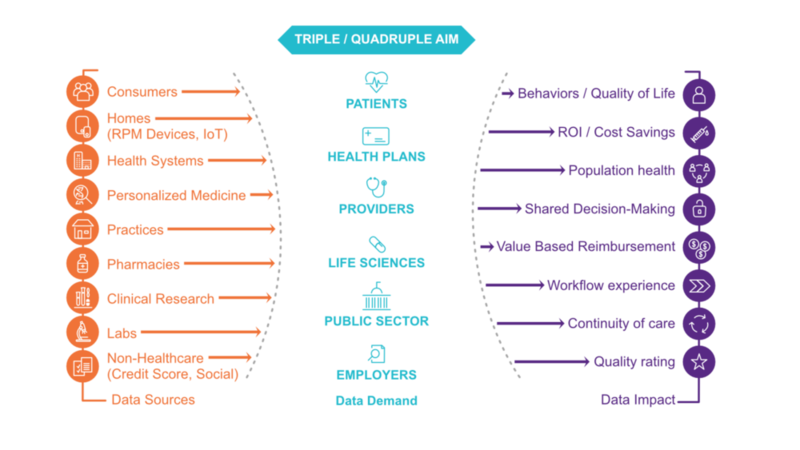 Like the Healthcare Lean Canvas, this Healthcare Value Tree identifies the same bundle of activities, services and products (operating drivers) that most directly impact enterprise value creation AND Healthcare Value. In our Healthcare Value Tree example, we added stakeholders (user personas), the solution feature set (colorize differentiated or unique features), the benefits and the value created. The Healthcare Value Tree can be used to show the relationship between your solution’s activities, services and processes and the value (cost, experience, outcome results) created based on objective measures. In this example, you can build further proof points in your healthcare value by constructing a business case. This may require evidence-base clinical studies of interventions similar to your solution (by proxy) to support your ROI model. In healthcare, Return on Intervention is equally as important as Return on Investment. One example of Return on Intervention in healthcare is predictive analytics for risk stratification of patients. Risk stratification employs predictive models can identify which individuals are most likely to incur high costs and help an organization focus limited resources on those that provide the greatest return on intervention. 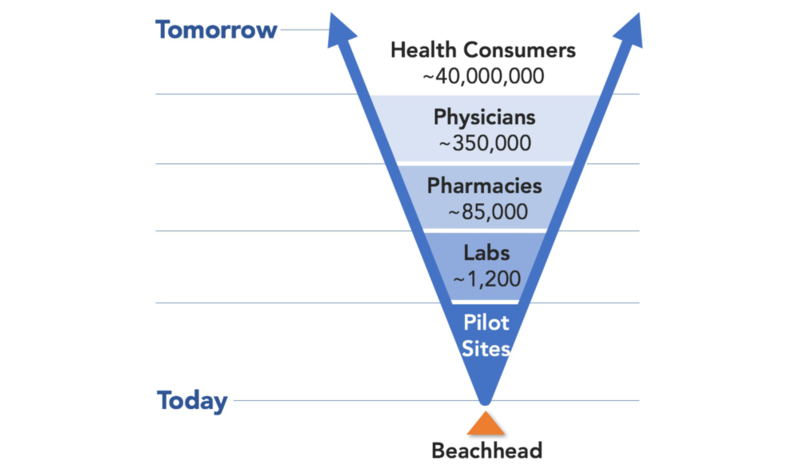 In healthcare, time horizon matters for ROI. Know your buyer’s healthcare time horizon. It’s important to identify when and for how long your bundle of activities impacts the buyer and stakeholders (i.e., customer’s jobs to be done and customer’s events such as interventions in a patient chronic care or acute episode). Your buyer, for example, may or may not be interested in your solution if it delivers savings beyond 90 days since these savings accrue to someone else (i.e., insurance company, employer or single payer). Reimbursement incentives such as value-based bundled payments, readmission penalties, capitation or alternative payment models can also change your buyer’s time horizon realized gain or pain points. See Healthcare Value questions in the Key Questions section. Finding high potential growth markets where you can realize value faster while mapping the needs of these segments to your solution is a key step for the Healthcare Lean Canvas. The key is to find attractive markets are under-served and customer segments that have a lower cost of customer acquisition (easy to reach, short sales cycles, faster adoption, and less competition). The best scenario is where you can create and dominate a new market. Being a follower in crowded healthcare digital health or device markets is challenging, particularly if your time, resources and cash are limited. Start by listing all the markets you plan to serve. Mass Market: If your product is relevant to the public (D2C or B2C), you have a wide range of potential health customers. This could be affordable virtual and in-person concierge medicine that is far more affordable than traditional insurance that you can pay for out of pocket instead of an employer deduction. Even though you may be focused on a solution for all health consumers, you need to be careful. You cannot effectively build, design, and position a product or service for everyone. Your market will likely be segmented further. In this example, we show an example of segmenting a market based on customer’s business model and their ability to pay for your solution. Niche Market: This customer segment is based on highly specific needs and unique traits of its clients. For instance, concierge medicine only for expectant women. Narrowly defining your target market can help you capture significant market share in shorter time. It also helps you becoming marginalized in crowded market battling large competitors or venture-backed startups using equity to buy the business. At the same time, your niche market should be big enough with adjacent markets to excite investors, result in a return on your effort and tolerate pivots in your business model. Your niche can be your beachhead. After listing your markets, identify the customer segments for those markets. If all customers in the market behave the same, there is no need to segment the market. If there are significant differences in your markets, you should consider further market segmentation (i.e., rehabilitation providers specializing in hips and knees versus rehabilitation providers for all types of orthopedic surgeries). Be sure to prioritize then target a segment given barriers to entry, intensity of competition and ease of access. Early adoption is important for early-stage ventures and innovative solutions. Understanding your buyer’s mentality and where they stand helps to lower the cost of customer acquisition. Crossing the chasm popularized the stages of adoption. See Customer Segment questions in the Key Questions section. Estimating your market size with meaningful assertions determines your solution’s appeal and risk for a go-to-market business case. Well thought assumptions backed by third-party market research, customer segmentation and customer validation build business case credibility, appeal and a faster glide path to sizing of your opportunities and risk. It also allows you to move on without higher personal cost. For example, a smaller market may carry higher risk, be unattractive to investors and not worth your time, particularly when competition is intense. 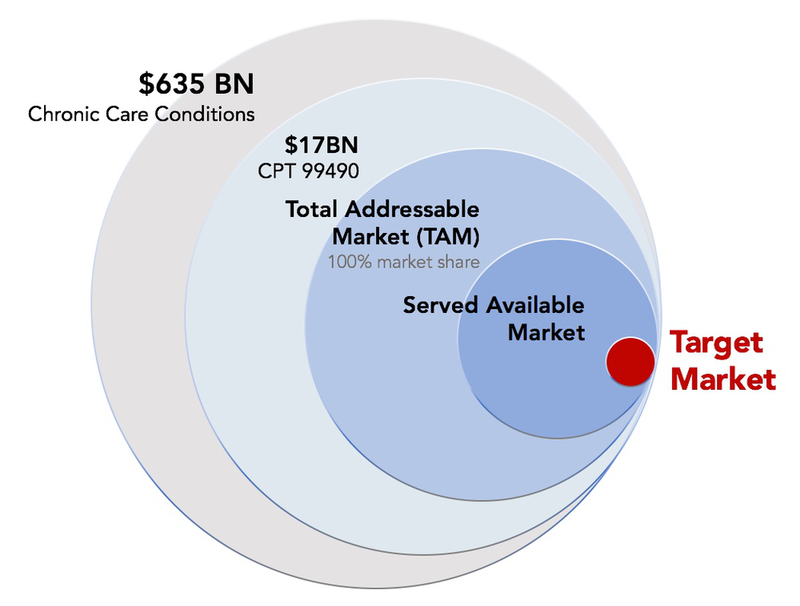 One mistake entrepreneurs make is to confuse the total addressable market (TAM) with the total spend in the market (i.e., total cost of taking care patients). The TAM is the $ market size for every potential customer to pay and use your product—assuming you have 100% market share. Assuming you captured 100% of the market share for your solution, how much revenue will you generate in one year? Given the competition, what portion of this market can you realistically capture in the next one, two, three ... years? The serviceable addressable market (SAM) are those subsets of customers who will pay for and use your product. Examples include early adopters and customers who are not using a competitor alternative or have a substitute for your solution. Typically, the Target Market represents those initial customers who are early adopters, have significant pain points and fit characteristics described in Crossing the Chasm. To generate credible market size estimates, it’s necessary to start with the total population of potential customers in the market for your solution. In healthcare, the size of your market can be determined by the services/procedures (utilization) multiplied by the number of patients during a one-year period. The number of patients is a subset of all health consumers (total population). The incidence or prevalence rate refers to a health consumer becoming a patient for acute episode (one-time knee replacement) or chronic condition (heart failure, back pain). Incidence and prevalence rates can be found in respected medical journals, the CDC and U.S healthcare data sets such as Medicare and AHRQ. There are similar healthcare services research organizations in other countries (United Kingdom’ NHS, etc.). You can also find great clinical and health economic research on-line at annual conferences where researcher scientists and healthcare actuaries convene. Other sources of information include investor presentations of your competitors or comparables serving similar target markets. Depending on the precision you need (i.e., due diligence for funding), market size estimates can take time, iteration and further validation. See Market Size questions in the Key Questions section. This Lean Canvas segment describes the supply chain through which you distribute your solution for sales purposes. In healthcare, channels can be very useful to gain market and customer access. Healthcare (B2B) sales cycles can exceed 12-18 months. Using sales channels that shorten your sales cycle on favorable terms, reduce your cost of customer acquisition and build your customer base quickly may be preferable to the cost, time and investment required for direct sales. Depending on the post-sales support services you provide and incentives, distributors in sales channels for software solutions can garner 50-70% of your sales price. Another approach is to use both direct and indirect sales (channels) depending on the customer segment, geographic region, etc. With a sales channel partner, your preferences for the quality of customer interactions may dictate whether to sell alongside, sell-through or have no contact at all with the customer. See Channels questions in the Key Questions section. 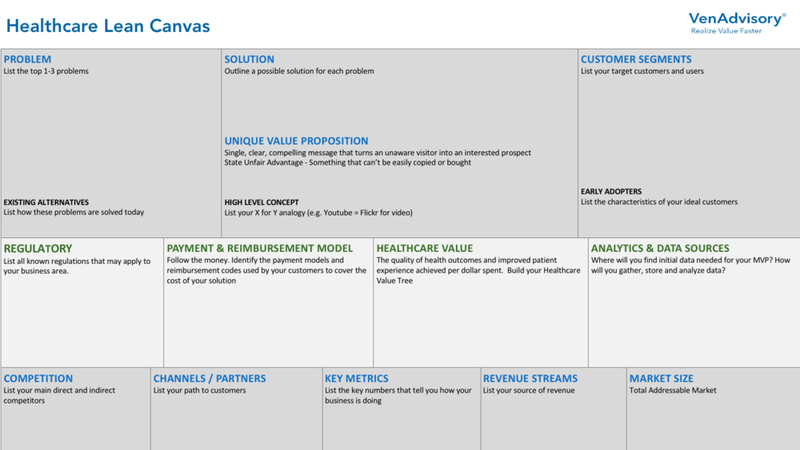 In this Lean Canvas box, articulate the types of revenue streams for your solution (services, product), and how revenues are earned based on your pricing and business model (i.e., subscription, transaction, purchase, per seat – per patient, provider, per member, etc.). See Revenue Stream questions m question in the Key Questions section. When setting prices for your services or products, generate enough revenue from your sales to cover the cost of acquiring a customer (CAC). Ideally, the lifetime value of the customer revenue should exceed the CAC. For example, for every dollar spent on acquiring the customer, you should get back more than three dollars over the lifetime of the customer. Using investor capital (your cap table in exchange for customer contract) to buy a business in for early-stage healthcare ventures should be avoided whenever possible. However, many large health systems and health plans, require concessions or deeply discounted pricing to earn their business. Recognize your pricing must account for the customer ROI for changing clinical/administrative workflows, EHR or systems integration and other IT dependencies to accommodate your deployment. Depending on your go-to-market or commercialization stage, it may be necessary to price with concessions to secure one or two pilots at reputable organizations. Proof-of-concept pilots at these healthcare organizations establish the proof points (testimonials, clinical studies – IRB, ROI, customer case studies) required for your sales success. Even better, proof of concept that converts to purchase based upon predetermined success metrics is a low friction sales tool. Another term that reduces pricing friction for early stage, proof-of-concept solutions is to offer terms of performance with minimum guarantees. In healthcare, business models have relied on risk sharing in cost savings. These are complicated multi-year payment term models and are challenged by confounding factors and lots of analysis. Revenue recognition and cash flows are other dimensions for pricing model considerations. Start with a free trial. A timed free trial lets the customer know from the start that the product has a price tag. Pick a price to test: Existing alternatives provide a good reference point for pricing. Base your test price around existing prices and potentially different terms (i.e., event-driven monetization). Reduce Cost of Customer Acquisition: One guidance is ensuring that the lifetime value of your customers exceeds the cost of customer acquisition by at least a factor of three. See Revenue Stream questions in the Key Questions section. How your customers are paid or reimbursed in healthcare affects your pricing and type of business model. Following the money in your market segment can be very helpful. Another helpful perspective is the value chain and where your solution fits. Lawton Robert Burns nicely capture the healthcare value chain. Source: The Business of Healthcare Innovation, 2nd Edition, Cambridge University Press, 2012. This value chain contains three key sets of actors and two sets of intermediaries. The three key sets of actors are the individuals and institutions that purchase health care—the Payers, actors funding healthcare services—the Providers, actors delivering healthcare services—the Producers who supply products for patient consumption or care. 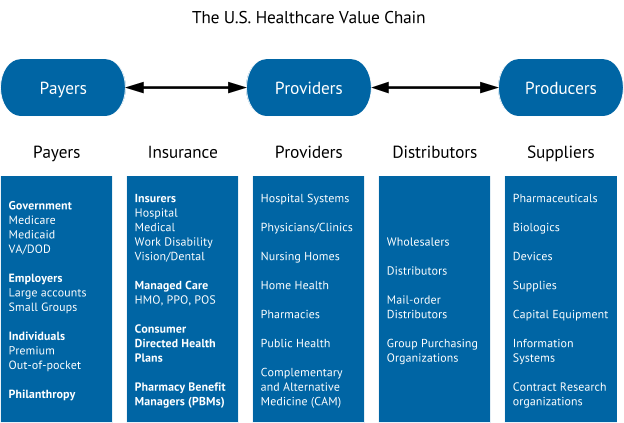 Two sets of intermediaries separate these key actors: Insurers - those firms who finance healthcare (collect premiums from Purchasers and pay claims as reimbursement to Providers), Suppliers those who produce products(medicines, devices, etc.) 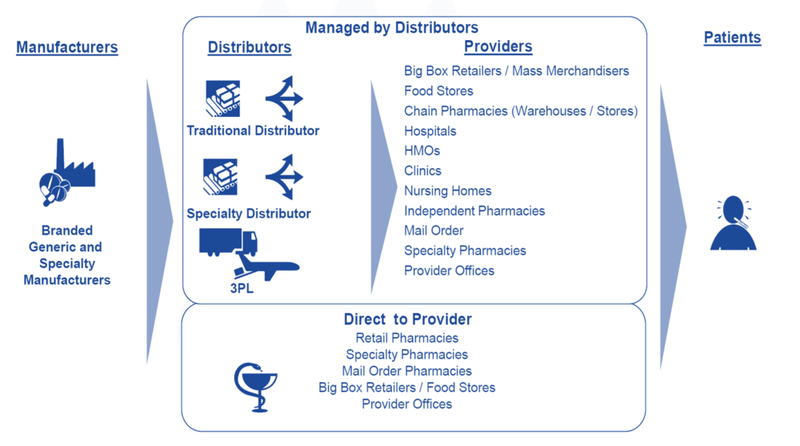 for direct patient care or enable healthcare patient outcomes and Distributors, those who support the healthcare supply chain. The payers for healthcare start on left side of the chart. 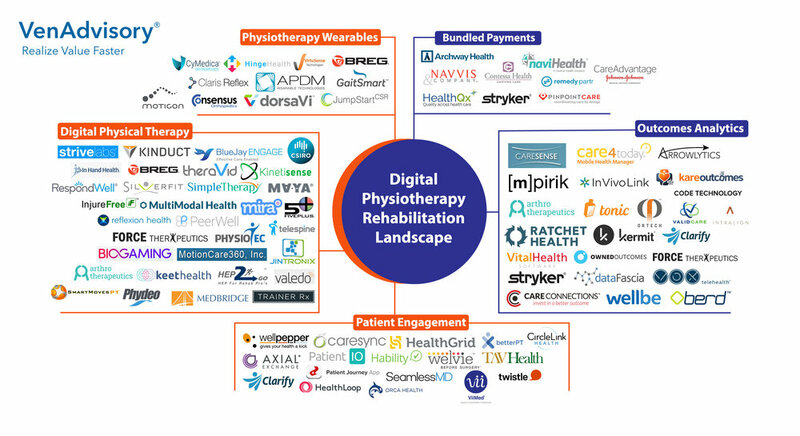 Conversely, much of the innovation in healthcare starts on the right side, with solutions used by providers and patients and paid for by the payers and buyers of healthcare services. Reimbursement and consumption meet in the middle—the Providers: doctors and hospitals who must determine how much of the innovation from the right side they utilize in patient treatment given reimbursement, incentives and the structure of payment (i.e., episodes of care, fee for service, global payment). This chart helps you visualize sectors where you have competitive advantage and areas where you can deliver the best value to your customers. It also helps you follow the money. Healthcare is driven by specialization. You will most likely not be able to perform all key activities—from production to marketing—within your organization, neither will you be able to provide all key resources by yourself. You need partners. These could be high-quality suppliers, distributors, marketers, etc. In this segment, list all partners who can help you leverage your business model and make it successful. There are three partnership strategies to consider. Coopetition: Coopetition is the act of cooperation between competing companies. Certain businesses gain an advantage by using a judicious mixture of cooperation with suppliers, customers and firms producing complementary or related products. Joint ventures: A joint venture (JV) is a business arrangement in which two or more parties agree to pool their resources to accomplish a specific task. Once you have identified your partners, create a future partnership plan to go with it. What are the numbers you can collect periodically about you key activities or the entire business model to measure growth? In the healthcare industry, data is everything. The entire value chain depends on data. Data allows every sector in the healthcare value chain make informed decisions ranging from improving quality of care to accurately recording performance and receiving reimbursements. Where will you find initial data needed for your MVP? How will you gather, store and analyze data? A good use of relevant data can help your organization effectively negotiate rates and contracting process needed to boost revenue opportunities with payers. Below are some of the sources of data you may consider. Healthcare is heavily regulated leading to additional business cost for first-time entrants to healthcare. Depending on the type of healthcare solution offered (pharmaceuticals, devices, diagnostics, direct patient care), the level of regulation will dictate your time to market and commercialization path. In this component, list all known regulations that may apply to your business area (HIPAA, FDA, 21-part 11) as well as security, engineering, connectivity and IT standards, if applicable. Identify someone on your team responsible for compliance. Now that your Healthcare Lean Canvas has capture key assumptions and value propositions, test them with customer conversations, external stakeholders, investors, and market feedback. Retire your canvas if it fails your gate criteria, or pivot and modify the canvas as necessary using these same steps. The lean canvas is never finished. The business model and solution will evolve, and entirely new revenue models and market segments may emerge requiring another flavor of your lean canvas. Every time you validate a hypothesis on your business canvas and add this to your canvas, you will notice how it affects other segments. 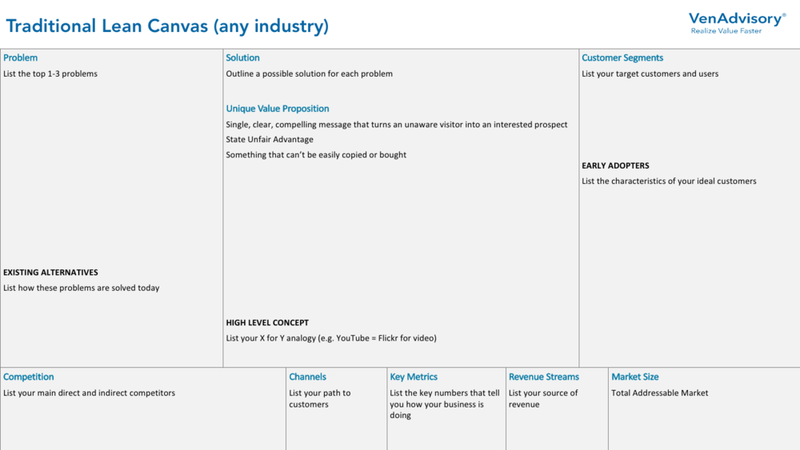 Lean Canvas is a variation of Business Model Canvas. There are other considerations as noted below that you may want to incorporate into your lean canvas. The Problem Statement. Sometimes, what may be a problem on the surface might be a symptom of a deeper problem. By reflecting on all angles to the problem with multiple perspectives (codesign), you can see the problem with fresh perspectives. This can lead to a better, more differentiated and usable solution for customers. What problems are you solving? What is the problem? How do you know this problem you are trying to solve is the (a) real one. Could there be a deeper underlying problem that is causing the one you want to solve? Can you think about this problem differently? Can you reframe the problem from a different perspective? Who else is solving the problem? If you solved this problem, can you do it faster, better and cheaper? Why should a customer leave current providers to sign up with you? Why should a customer pick you over your competitors or alternatives? What social or cultural factors helps sustain or shape this problem? Do you have evidence that this problem is worth solving? What evidence do you have that if you solved this problem, it would be worth the investment? What are the current solutions to the problem? Who is providing the current solutions? What makes your solution different from the current solutions? In what ways are your solutions better than the current? Is your solution needed by your perceived target customers? How will your solution make their lives better? Does your solution have the ability to return a good profit? How do you know this? What is the duration of your solution? Is it a quick fix? Short term? Or a longer term solution? In what ways is your solution unique? Do you need to integrate your capabilities with partners who are also competitors? What are the current solutions to the problem and why is yours significantly better, cheaper or faster? Why is now the right time to offer your solution? Does your solution comply with all or infringe on any existing trade or tax laws? Can you A/B test your solution with an inexpensive MVP? If your solution is premium priced, can you demonstrate improved outcomes (return to work functional status, reduced mortality, quality of life) and lower healthcare costs? What is your solution’s value at what touch point in a clinical pathway or patient journey and at what cost? How does your solution address care and emotional states during the patient journey? How does your solution address your buyer’s reimbursement model or financial risk? How do your offerings interact with stakeholders and patients to create value across the care continuum? For example, where does your solution create value in clinical workflow and in what setting across the continuum of care (inpatient, post-acute care, etc.)? How is this value different than what EHRs can do today with sharing of patient records across multiple systems? Is this value different than other tools that allow patients to share their health information with anyone they choose not matter who they are? How is your solution (product or service) faster, cheaper, better? What the reasons for your customer to believe you (i.e., claims, proof points)? Does your solution create higher value that competing services, products and alternatives in your target market today? How is yours different from already existing solutions in the market? What value does your solution deliver to the customer? Which one of our customer’s problems are you helping to solve? Will this customer pay for your solution or is it someone else (follow the money)? What are the benefits of the bundles of products and services your offering has to each customer segment? Which customer needs are you satisfying (functional, emotional social)? Target: Who is buying? Described by a demographic, psychographic, benefit derived from using the category and/or using the brand, an aspiration, category usage, size of business. Can be a persona. Category: This describes what the customer is buying, or what they would buy if they didn’t buy you. It helps the customer to know whether to listen to the message or filter it out, helps our stakeholders tell others about us. Reason to Believe: Proof, why the customer should believe the benefit, often the feature set that brings to life the brand’s benefit. More and more, the reason to believe is more important to the consumer than the benefit. He wants proof. Brand Personality: Tone, voice. If the brand were a person, what adjectives would you use to describe them? Consider including an archetype. The tone of Nike is very different than the tone of J&J. How do other companies and competitors reach your customers now? Are there new channels currently not explored/not used? Which channels do your customers prefer? Based on the customer segment served, are you better positioned to go directly to these customers or using a distributor/sales channel? Will you depend on third party entities (major distributors or marketers) to reach your clients or will you use your own channel? Are your preferred channels regulated? What are the applicable regulations? How are you integrating your channels into customer routines? How will you put place your product with your target customers to get their attention? How will your business relationship evolve as your solution evolves? What marketing and sales channel support will you receive? Will you sell your products on specialized industry sites or consumer sites (Amazon, Walmart, etc.) or will you just sell on your website or a combination? If you use a channel, how will you deliver your brand messaging value proposition (product or service) to the customer in a fast, efficient and cost-effective manner? How will you provide post-purchase customer service support? How many possible ways can you make money from this solution? How much will each revenue source contribute to the overall revenue? How will you make money from each customer segment? We will talk about customer segments in the next section. What values are your customers willing to pay for? What values are your customers paying for at the moment How will your financial model keep pace with your buyer’s changing revenue streams and business model (i.e., value based payment, fee for service, capitation, etc.)? How are they currently pay? Will your solution result in a tangible product you can sell for a fee? Will your solution result in a service customers will pay (subscribe) to use? Is it an intellectual property that customers will buy licenses to use? Is it a product you will lend, lease or rent out to customers? Will you be generating revenue through offering an intermediate service between two parties? Are you a broker? Can you generate revenue by allowing other business place advertisement on your product or services? Can you identify which customer segment will feed into the different revenue streams you listed above? Does your sales revenue cover the cost of customer acquisition? What is the lifetime value of the customer? The following questions help you reflect on the identities and behaviours of your target customers. Good insight on your target customers can help fine-tune and strengthen the appeal of your solution. It can also help your team use resources more efficiently needed to reach your target audience, as well as find common denominators that group them for easier targeting. Does your solution solve these pain points fully, partially, or not at all? What are the assumptions or hypotheses that must hold true for your solution to solve your customer’s pain points? Can you organize them into groups according to collective needs you can address with any aspect of your solution? How many groups (customer segments) do you see? Can you describe the groups above in personas? Can you draw the persona or stick a picture on the wall? What are you offering each group identified above? Can you classify them as buyers, users, subscribers, etc.? Can you prioritize your customer segments? What is the population of your group of customers: Do you have figures? Can you make informed estimates? What percentage of the target customer base can you reach? How will you effectively reach them? How frequently will you interact with them? What can each target customer grouping offer you in return? How will convert an “I don’t care” target customer into a long-term customer? Understanding your competition and where they play against components of your solution demonstrates your knowledge of the business environment and industry segment. It helps you see how your solution is different or not (me too). Does your solution give you an unfair advantage over your competition and how can you exploit that advantage to gain control of a profitable chunk of the market? Assuming you captured 100% of the market share in your area of focus, how much revenue will you make in one year? Find out how we help accelerate your growth. Let's get started! Complete and send the following form or call us at +1 (206) 488-1775. When it comes to starting a business using the lean business canvases, a lot of energy has been put into making the process easier for both new and existing business. We have curated the best 16 resources out there for you, ranging from the absolutely free to the paid ones. Here, you will find resources to guide your ideation, experimentation and validation, and going to market. For Healthcare organizations, the process is no doubt, convoluted. We have included healthcare specific guides you may find complementary to our Healthcare Canvas. Should you ever need professional guidance through your processes, click here to speak to one of our advisors.